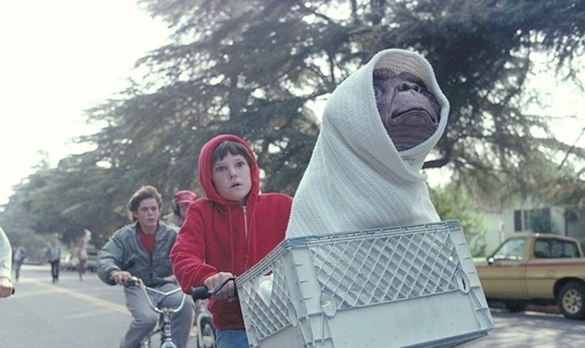 Watch Henry Thomas’s Heartbreaking Screen Test for E.T. It’s been thirty years since we lost our hearts to a small boy and a marooned alien and in a few weeks the 30th anniversary of E.T.’s release is marked by a Blu-ray release with some new extras and a shiny high-definition gloss. Through unprecedented merchandise saturation, landfills stuffed with Atari cartridges, walkie-talkies replacing guns, a cameo in The Phantom Menace and so on E.T. remains a warm-hearted, stone-cold classic and key to the film’s success is Henry Thomas – the boy who cried. Thomas’s Elliott is as recognised as his alien friend and as part of the special features on the new disc you can see exactly why Spielberg chose this boy to break our hearts. The video below may not have John William’s soaring music nor the light-fingered alien but you can see why young Henry got the part. Here he is, Elliott before Elliott, melting hearts and drawing tears. We’re looking forward to seeing what other treasures the 30th Anniversary Blu-ray has in store. E.T. the Extra-Terrestrial is available on Blu-ray from 22nd October. © 2012 Universal Studios. All Rights Reserved.